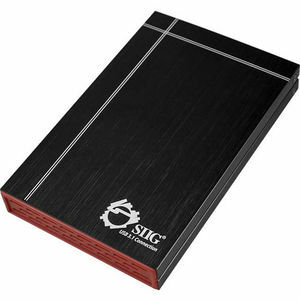 SIIG's USB 3.1 to SATA 2.5 External Hard Drive Enclosure is a cutting-edge product designed to enable SATA 2.5" hard disk drives to work with your USB 3.1 10Gbps enabled desktop or notebook computer. This slim and portable enclosure instantly adds extra storage space of up to 8TB in capacity to your system, delivers maximum data transfer rates of up to 10Gb/s (up to 2 times faster than USB 3.0), and allows you to hot-swap the enclosure (connect and disconnect) without first turning your system off. This USB 3.1 10Gbps enclosure is super easy to set up, no driver installation is required, and is an excellent mobile storage solution for transferring large volumes of data at high speed between your external SATA hard disk drive and the computer. Simply install your 2.5" SATA hard disk drive into the USB 3.1 enclosure and experience the speed of USB 3.1 technology.